PHOTO: Allen Ramsey, DWCPhoto.com. Highlands sophomore Nick Gish (middle) makes a move in Tuesday's 36th District championship game against Newport Central Catholic at Tower Park. NewCath won 2-1. The first goal came with 21:40 left in the game. It favored the Highlands Bluebirds soccer team. 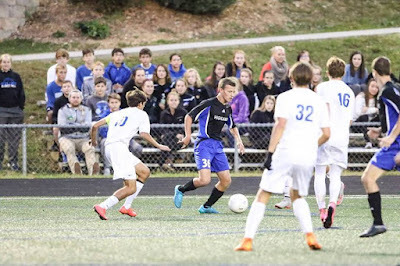 But the Bluebirds (9-10-3) could not hold off the arch-rival Newport Central Catholic Thoroughbreds (13-5-2) falling 2-1 in the 36th District championship. NewCath has won three of the four district championships since the two starting playing just each other for district championships in 2012. The Thoroughbreds turned the tide on the Bluebirds this year. NewCath also won the regular season meeting 3-2 on Sept. 10 at Morcher Field. Highlands won both the regular season and district championship last year. "NC did what it does best," said Matthew Winkler, Highlands Head Coach. "They find those that they can slide through. They chase and play hard. We knew coming it was going to be a hard and physical game. We knew it was going to be competitive for 80 minutes. You would hope the first guy that puts in a goal would dictate the game. Sometimes it works against you." But if there is one team this year's Highlands team can look to, it's two years ago. Highlands lost to NewCath in the district championship, but came back to beat NewCath, 1-0 in the 9th Region championship. The Bluebirds lost to eventual state champion Lexington Dunbar in the state quarterfinals that year. "There are a few boys who remember that run," Winkler said. "We have some work to do. There's not a whole lot you can change drastically at this point, but you can fine-tune things, make sure things are clicking on all cylinders and make sure whoever we play Tuesday we give our best effort." 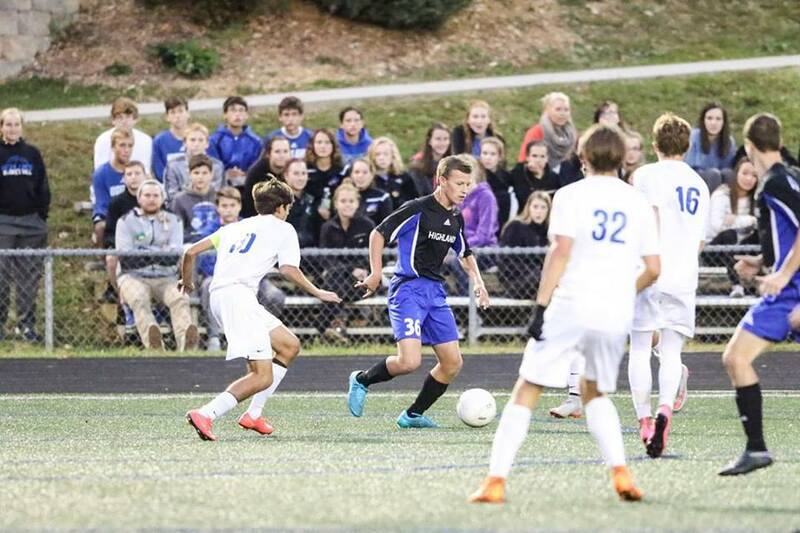 Brady Gesenhues scored the first goal on a penalty kick. It came after junior Ethan Mills drew the penalty in the box. Gesenhues and Mills led Highlands with 14 goals each on the season. But the lead did not last long. NewCath senior Ryan Hans put in a rebound just 31 seconds later to tie the game. NewCath scored the game-winner with 3:26 left in the game. The leading scorer for the Thoroughbreds in senior Andrew Liles took a nice pass from Eddie Schutz for his team-high 20th goal of the season. Highlands did have a chance with two corner kicks in the last minute. But the Bluebirds could not put in the equalizer. NewCath outshot Highlands, 18-14 but only nine came on goal compared to 10 for the Bluebirds. Joel Grosser made nine saves for the Thoroughbreds. Highlands booted out a number of passes into the box playing solid defense. Goalkeeper Paul Tully made six saves for the Bluebirds. "Our defense played well. Our defense is starting to come together," Winkler said. "Everything up to this point was getting ready for the postseason. This is probably the top game as far as playing as a unit for 80 minutes goes." The 9th Region Tournament starts Tuesday. The Bluebirds will hit the road against another district winner. The Ladybirds (14-7) did not have to finish the district semifinal game against Dayton because Dayton could not field a team. The win gave the Ladybirds their highest win total since their last region championship in 2010. Highlands takes on All "A" State Champion NewCath (20-1) in the 36th District championship game at Tower Park on Thursday. Game time is 7 p.m.